My copy is identical to this one but without the "SBM U" etched on side A. Anyone got more info? 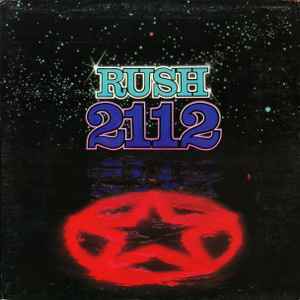 To my ears, this is the definitive pressing of 2112. The mastering has a more full, less midrange scooped, sound than the vintage versions I have compared it to. My pressing is flat, quite, and without any detectable flaw. Just trying to find out where my release fits and noticed your comment "without MAPL logo" in the Notes...in looking at the images for this release that MAPL logo is on the labels - so maybe a typo here? My pressing came out scratched a little bit on "Overture" but other than that, it's one of the best repressings i've ever heard. When you see "Pressed By – GZ Media" run like Hell out of these pure garbage. My copy has CRC lower right back cover and is one character off on the Runouts. Otherwise identical. That is insufficient for a new entry, correct? I have a question, the version I have with the same identifiers is the 180g edition. The note to this release suggest it is the 200g edition. Just want to check whether the notes here have been marked up correctly - I see there is another version that is specifically the 200g release ?